This smartphone has a classy and elegant look with great additional features. *Light weight easy to carry and hold. *Single tray for sim n micro SD card u have to choose between micro SD card or a dual sim. Disappointed. Really not at all satisfied. I bought this mobile for my office work a year back and here is the review I would like to give, Well I think given the purpose I have to use my phone it works good for me , but there are surely other better options available for a similar price. 4 Pricebaba users have written their experience with Gionee S6. 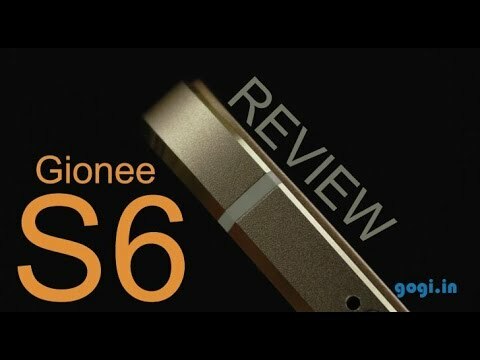 If you own Gionee S6, please do leave your feedback too. Lowest price of Gionee S6 price in India starts at Rs. 6,999 Gionee S6 is available on Flipkart at Rs. 6,999 and on Amazon at Rs. 7,920. Prices updated on 20th April 2019. Chinese smartphones have in a way revolutionised the way we look at smartphones in India. They have in a way changed our definition of mid-range or budget phones to the point that today we have devices in the Rs 10,000 range that come with fingerprint scanner. The competition in the budget range is hot and Gionee is one of these Chinese players, in there doing its best to offer the best value for money to the consumers. The Gionee S6 comes with a 5.5 inch Full HD Super AMOLED display. Powering the phone is an Octa Core MT6753 Chipset, which is also present in devices such as Lenovo K4 Note, Coolpad Note 3 etc. On the memory front, you have 32 GB internal memory which can be expanded thanks to the expansion slot which supports up to 128 GB Micro SD card. Keeping up with the changing times, the Gionee S6 comes with a Type C connector port. On the software front, the S6 runs Amigo 3.1 on top of Android 5.1. We have seen the same version of Amigo on pretty much all the gionee phones launched in recent times, including: Elife S7, Marathon M5 and the F103. The battery on the device is a non-removable 3150 mAh, which cannot be removed. The rear camera on the S6 is a 13 MP sensor while the front facing snapper is 5 MP. There is a single LED flash on the back of the device to help you shoot in dark conditions. Gionee S6 is a VoLTE enabled phone and supports Dual SIM cards. Sadly though, only one of these SIM slots supports LTE while the other one is GSM. 1. Does the Gionee S6 support Reliance Jio network? - Reliance Jio network with VoLTE calling is supported with the Gionee S6. - Unfortunately, yes. The phone has a hybrid second slot, meaning in the second slot you can either insert a secondary SIM or add a MicroSD card to expand the storage of the phone. - One of the two slots in the Gionee S6 accepts a Nano SIM card. - The phone uses a USB Type-C port for charging and data syncing. USB Type-C port is the future but since the port is not a universal standard yet, you might have to carry the supplied charger along instead on relying on a friend's charger. - You get 23.18GB storage available to install apps and store other data out of the 32GB onboard storage. - Looking at the Android update trend from Gionee for previous devices, it is very unlikely for the Gionee S6 to receive any further Android updates. 7. Does the phone support 4K video recording? - No, Gionee S6 misses out on 4K video recording capability. 8. What are the in-box contents received with the device? - Gionee S6 box contains the handset, wall charger, data syncing and charging USB Type-A to USB Type-C cable, a SIM ejector pin, a pair of earphones and additionally a translucent TPU case to protect the phone.